Built 1906-1908 by Paul Lindt and Max Hofmann for the "Burgergemeinde Bern" guild, replacing a school/university building. 2017-2019 major renovations. 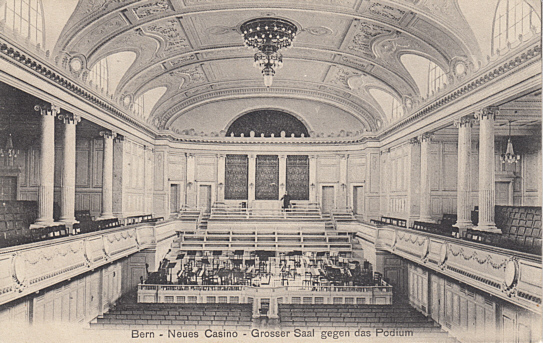 The complex contains a restaurant, several function rooms and two halls: the Grosser Saal (up to 1200 seats) and the Burgerratssaal (up to 300 seats). Also known as "Kulturcasino". Home to the Berner Symphonieorchester. 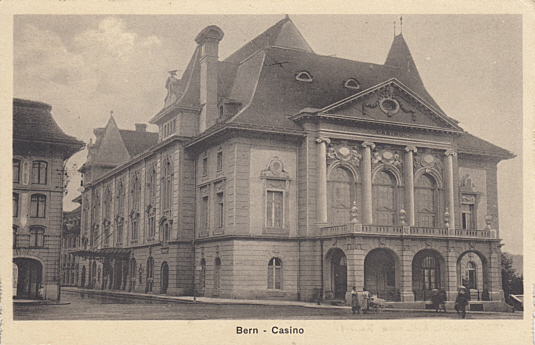 Front Text: "Bern - Casino"
Front Text: "Bern - Neues Casino - Grosser Saal gegen das Podium"